To live alongside a predator like an African lion, most prey species have had to develop some kind of defensive ability or strategy to avoid being eaten into extinction. For many creatures, this has meant evolving long, swift legs, or forms of camouflage, or at least learning to hang out near other potential targets that a lion may find tasty. Domesticated cows living in Africa are mostly out of luck. They have some safety in numbers, but they’ve otherwise been bread to be docile, hungry and relatively slow, which makes it hard for them to stay out of the crosshairs of hungry lions that live near farms and ranches. The cows secret weapon may turn out to be the i-cow Project, which, if successful, may end up being good news for the lions as well. The premise of the i-cow project is to incorporate evolutionary tricks of other species to try and get farmers’ cows off the lions’ menu. While looking for ways to curb lions’ appetites for beef, conservation biologist Neil Jordan observed an impala (Aepyceros melampus) avoid a lion attack not by running, but simply by looking at the stalking lion from a distance. The lion realized it’d been seen and lost the element of surprise, then moved on to find other prey. As ambush hunters, lions don’t want to use extra energy chasing prey that’s got a head start on its escape, making any animal that spots the lion a less attractive catch. This scenario made Jordan wonder if such a trait could be quickly added to the local cattle, giving them a defense against lions much faster than evolution ever could. At this point Jordan started thinking less about impalas, and more about insects. Many forms of insect rely on eye-shaped coloration, usually called eyespots, to frighten or at least distract predators long enough for an escape. 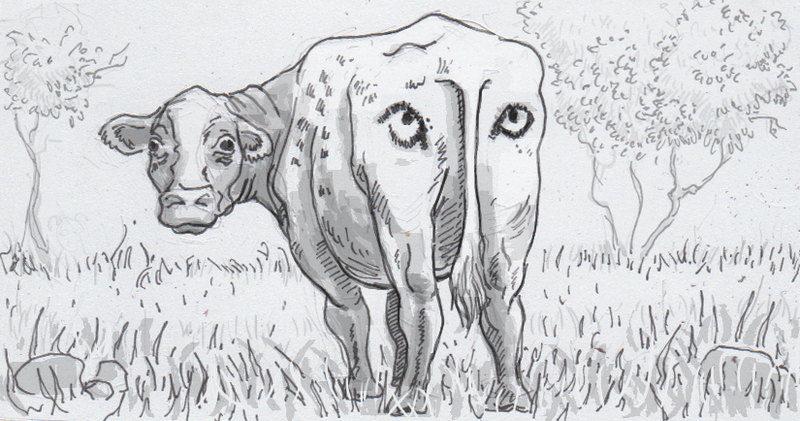 Most of the time, this defense is between something like a moth trying to confuse birds, but Jordan was hoping that some well-placed, artificial eyespots on the cows would convince lions they they were far to vigilant a creature to bother chasing down. With simple acrylic paint and some homemade stamps, a small batch of cows had eyes painted on their rears, and after an initial test with a small number of cows, it seems that the i-cows may indeed be convincing lions to leave them alone. A second round of testing is now under way, with more painted cows, plus tracking devices on both cows and a few lions to see just how effective this strategy may be, and rule out other explanations for painted cows’ apparent safety. Even though the paint isn’t a huge investment, and fake eyes don’t seem to bother the cows, Jordan wants to be sure this plan makes sense before pushing it with local farmers. Losing cattle to lions is a big problem for these people, and they often try to prevent further losses by killing lions. Over time, this has made the farmers a considerable threat to lion populations, and so if painted cow-butts can keep the lions from threatening the farmers’ livelyhood, it will actually be a huge benefit for the lions themselves.